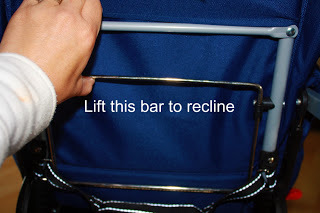 Recline: The front seat has 3 different recline positions Which is different from the 2009 models which only have 2 recline positions. The child riding in the back does not have a seat back, so no recline. 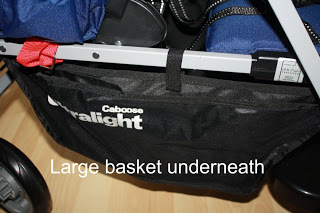 Basket Size: Wonderfully large basket with very easy access for child sitting in back, and storage pockets on the side! I am one of those moms who hate clutter, so when I do go places I take as little as possible, and I can’t stand bulky diaper bags! So the basket is nice to throw my wallet, a couple of diapers and our sweaters in and that way it leaves me more room to shop! Parent Organizer: This deluxe Cool Essentials Parent Organizer slips on in Seconds! 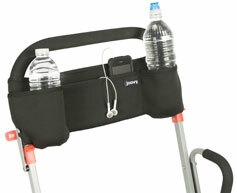 Over 2 feet of total storage- this organizer holds water bottles, cell phone, keys, sippy cups, iPod, and anything else you don’t want to lose! The beverage holders (2 of them) hold full size water bottles snugly – and even help to maintain the temperature of the drink (Cool Essentials!). The organizer even offers a small zipped storage compartment on the back for storing. 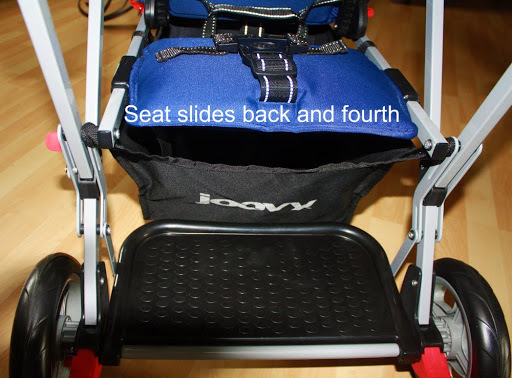 This comes standard with every joovy stroller! Child Tray: The tray contains two spots for sippy cups, and a nice flat surface for kids to play, eat snacks, etc. Well made and nicely positioned. I also noticed that the tray for the 2010 model come off allot easier than the 2009 which is nice. 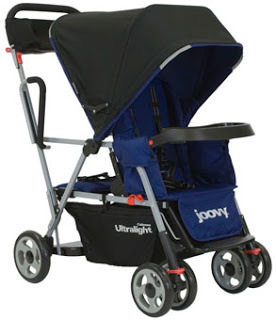 Wheels: Good wheels on a double stroller are essential, and the Ultralight doesn’t disappoint. The wheels work well and are sturdy. A smooth ride for all. The 2010 model all come with the 4 wheel suspension also. 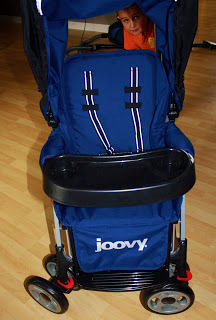 Canopy: Joovy has the canopy concept mastered. Their canopies are large, easy to use, provide excellent sun and rain protection for both front and back, and have a great look to them. We love the color – and have received many compliments on the color and canopy! break when I use them to keep the hood open. Weight/Height: The Ultralight is rated for 45 lbs. in the front and 45lbs. in the back. As you can see my two oldest fit very comfortably! 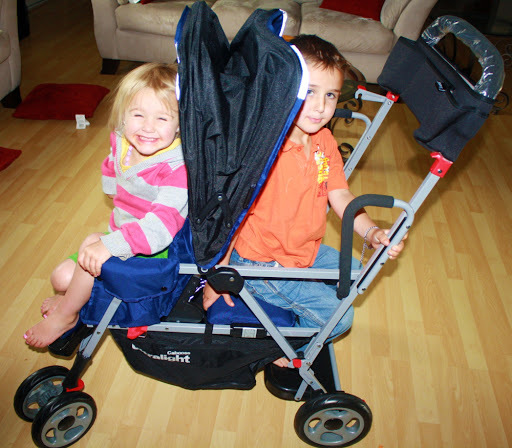 I also can fit my 1 year old in the front and both kids can sit side by side in the back! No more whining! Toddler Options: This fun seat can slide back and forth for the options of the child to either sit or stand and also has a harness to keep the child confined if needed. Any parent with an “independent” child will love that there are options for sitting, standing, or even pretending to be a “worker” on the back of his truck! My son will ask me to stop so he can jump off to pick up a leaf, and stand again on the platform with serious orders to resume our journey! 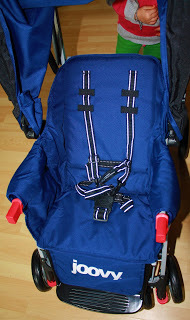 He also has his very own mesh pockets on the back of the front seat within easy reach for him. Besides its wonderful ease of use, I think my favorite part of the Ultralight Caboose is that the older child has independence and options. Think about it – the youngest child usually need the most attention. As parents, we sort of depend on the older child to be more independent and well-behaved. The Ultralight recognized this and made the back seat the place to be! and hold on and he can’t even walk yet! 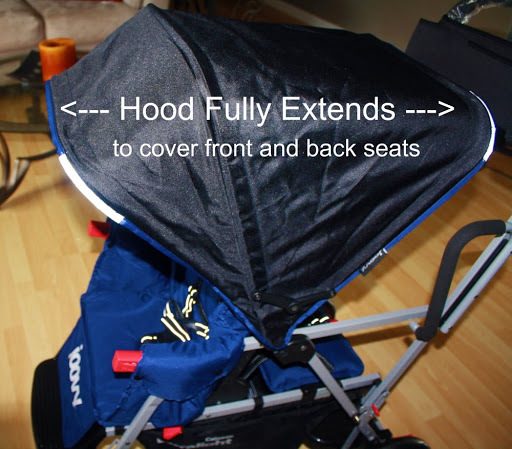 This stroller over exceeded my expectations! If you don’t want to wait for the contest head over to Joovy and go buy one! 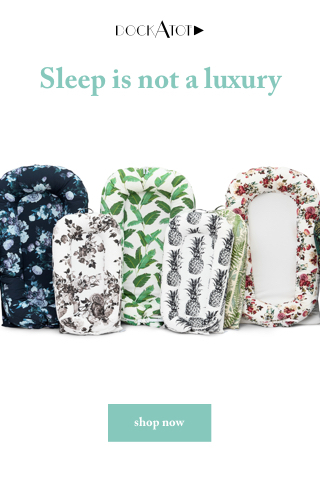 You will love all the different color options also! 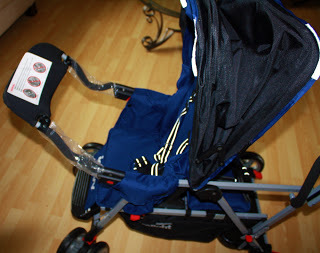 Want to win this stroller? Contest open to US & Canada residents only and you have 48 hours to contact me after the contest ends or else a new winner will be drawn..